My parents came to visit us last week and it was so great to see them! They hadn't seen my boys since before their mission (they left just after Thanksgiving 2013) so it was a fun reunion. Since my brother and his family live near us too, my parents split up their time sleeping at each house. On Friday, we went on a little adventure. We all drove up to Deception Pass and it was beautiful! Too bad I didn't get a picture with my kids when they were smiling. I can only get them to smile when I'm behind the camera and acting like an idiot. Mama is good at the slap stick! 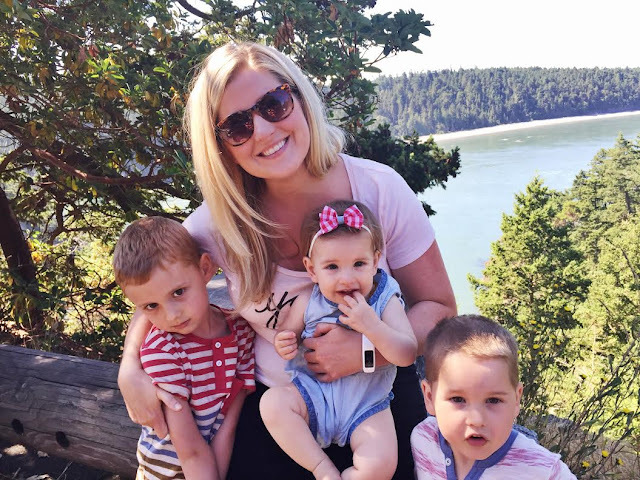 After walking across the bridge and being mildly freaked out about one of the kids falling into the swirling depths below, we all hopped back in the car and booked it to the ferry terminal in Anacortes to go to Friday Harbor. There was NO parking and we finally got a spot 2 minutes before the ferry left. This is the part where 5 adults, 4 kids and 2 babies barreled down the hill to try to make the ferry in time. We literally made it at the last second. All the stress! It was beautiful though, and riding the ferry is always a good time. I didn't take enough pictures and I'm kicking myself for not taking some pictures of my kids with my parents. Ugh. 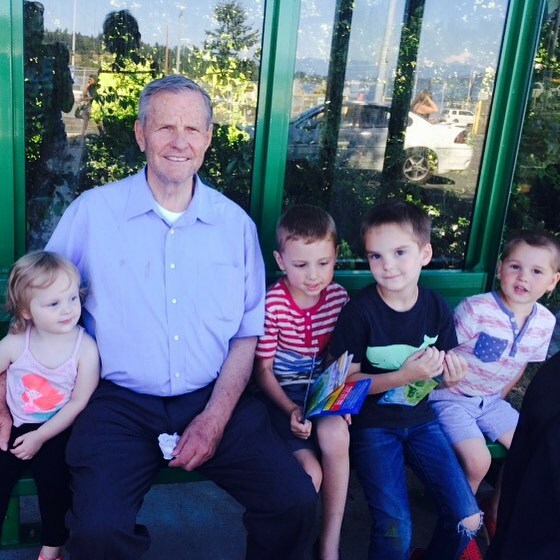 Luckily, Leone took this one of my dad with the kids at Friday Harbor. Before or after we ate pizza and ice cream, like true Americans. It was a fun day to remember... so I'll not mention the flat tire I had on the way home to help my memories stay positive. Because of the car trouble and some other events, William ended up staying the night with his cousins. So when we woke up on Saturday morning, David and I just had Fritz and Loulou. We put them in carriers and hiked down the hill on the trail near our house to go have brunch. 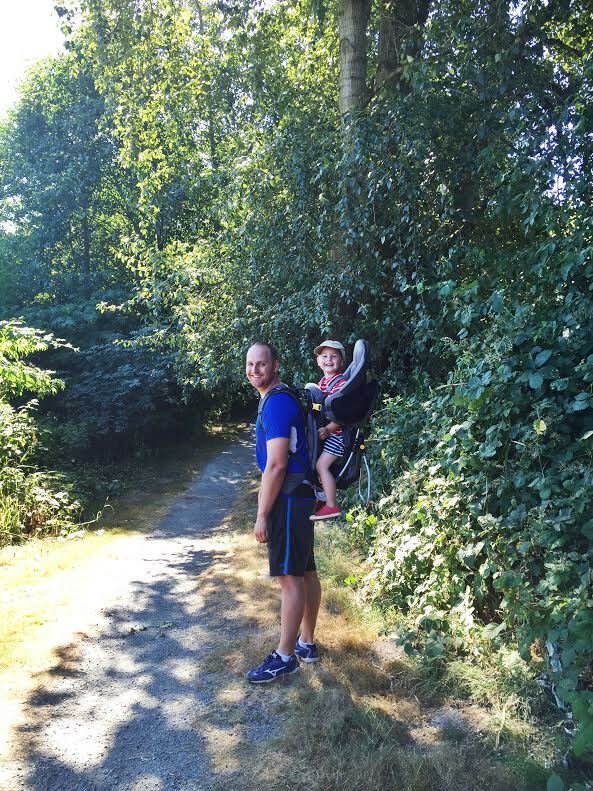 It's such a pretty hike and I wondered why we don't do that more often. Unfortunately, nothing was open when we got there because of the holiday, so the hike ended up being around 6 miles and we were hungry. I'm normally a big planner but lately, not so much. It was still fun though and I wish we could make it a weekly thing. We headed over to my brother and sister-in-law's house that afternoon for dinner with a bunch of friends. 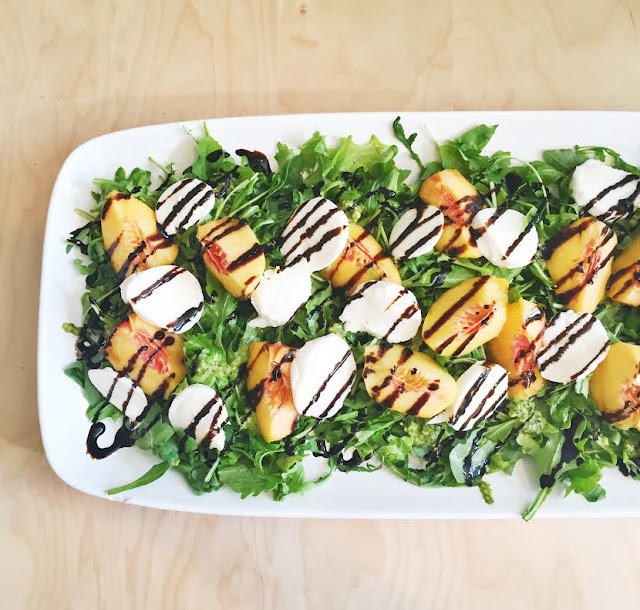 I made a salad of arugula, pesto, mozzarella, peaches, balsamic glaze and a squeeze of lemon. It was a big hit! Then we walked up the hill to watch fireworks, which were not a big hit with my kids. I think they were really tired. The proof is in the fact that they slept in the next day until 8:30-9:00. We all needed that rest after a fun-filled week! We are so glad my parents came to visit! 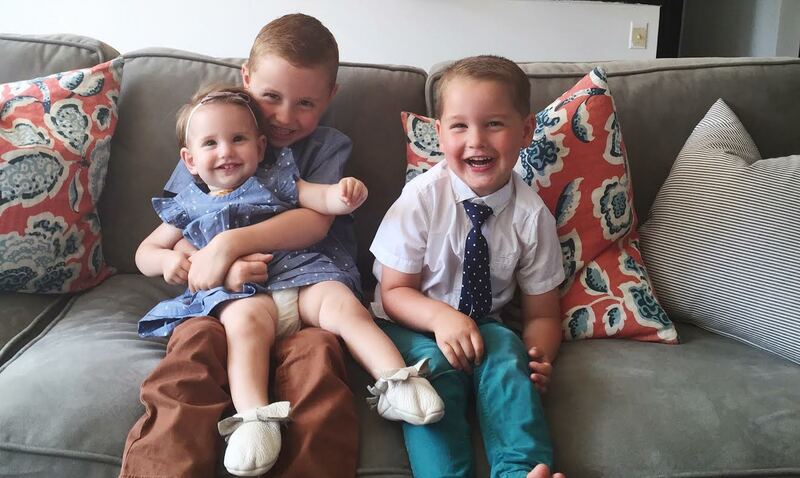 I leave you with this picture from Sunday morning when all three chickies were dressed and ready for church. I love them so much! Oh my goodness.......in that first picture, you look exactly like Charity! Seriously!